Vienna is full of incredible art – but where do you start? This museum is one of the largest collections of modern Austrian art, featuring the world’s largest collection of Egon Schiele’s works, as well as Gustav Klimt, Richard Gerstl and Oskar Kokoschka. Located within the beautiful Hofburg palace, the Albertina is one of Vienna’s most popular galleries, boasting works from modern graphic to impressionism. Great artists such as Klimt, Monet, Picasso and Degas have works displayed here, as well as some more modern photography and architectural collections. Also known as the Museum of Modern Art, the Mumok is one of the city’s best collections of contemporary art, containing pieces by iconic artists such as Andy Warhol, Pablo Picasso, Roy Lichtenstein and even Yoko Ono. With over 9,000 works to view, this gallery is certainly worth setting aside an afternoon for. Situated in one of Vienna’s most iconic buildings, the Kunst Haus is one of the most eclectic galleries in the city. 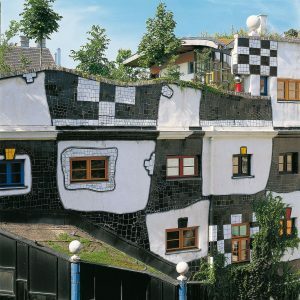 Also known as the Hundertwasser Museum, the gallery is dedicated to artist Friedensreich Hundertwasser, showing a vast collection of his paintings, graphics and other designs. The magnificent architecture of this building creates the perfect backdrop to the artistic treasures collated by the Hapsburgs. With collections spanning from Ancient Egypt to the Renaissance and Baroque, the Museum of Fine Arts houses paintings by Rembrandt, Vermeer, Raphael and Rubens, not to mention the world’s most comprehensive collection of Bruegel’s paintings. Identical to its twin building, the Museum of Natural History, the Museum of Art History is famous for its Kunstkammer exhibition, a chamber of ‘art and wonders’ containing over 2,000 ‘curios’ such as carvings, paintings and fossilised sharks teeth. If that wasn’t enough, the rest of the museum houses collections from Ancient Egypt all the way through to modern day, with regular exhibitions from contemporary greats. Situated in the stunning baroque Belvedere palace, now an UNESCO World Heritage Site, the gallery holds one of the greatest collections of Austrian art dating from the Middle Ages to the present day. The Belvedere provides a near-complete overview of the progression of Austrian art, bejewelled with such gems as the world’s largest collection of Klimt, and masterpieces from Egon Schiele and Oskart Kokshka.